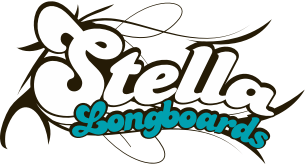 Ride with Stella and move with the flow of inertia as you weave down a beachy sidewalk on a warm summer day. The sun sets over the Pacific Ocean when you reach the bonfire that’s just getting started. Now crack open a cold one with your friends and relax after a long day of shredding. You’ve just had the Stella Experience. Specifications:Shape: Twin Drop Down / Drop ThroughConstruction: 8 Plys 100% Canadian MapleSize: 39.75" x 9.75" Wheelbase: 31"Trucks: Taco Trucks 180mmWheels: Stella Mondo 75mm 83A Griptape: Stella Extra-Coarse* Components may differ from the images shown. Stella Stickers - Available in 2 colorsFree shipping on stickers.